Insects have long been objects of wonderment for the kids. They are characterized by their unusual color patterns and unique physical structures. Some even have intricate designs on their bodies. These interesting physical characteristics arouse curiosity in young minds. Insects are also subjects of many creative arts. 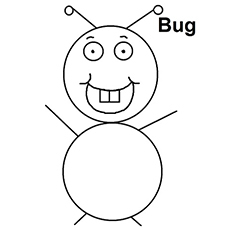 The best way to hold their interest is by providing them these bug coloring pages printable. Kids love filling colors in the black and white diagrams of insects. This article features the realistic and cartoon form of different types of insects. 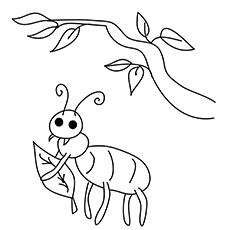 These bugs coloring pages to print will serve as an important tool for education and creative development. 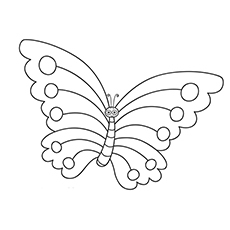 Here is a big butterfly for your kids to color. Butterflies are very popular amongst the kids. They love to chase the butterflies in the garden. Butterflies are a class of insects belonging to the Lepidoptera family. They are characterized by their scale-covered wings. All the butterflies have six legs and feet. Their taste sensors are located in the feet. They can taste the food just by standing on it. 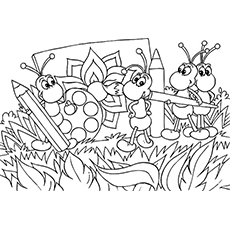 The coloring sheet features a group of ants painting a flower diagram. You and your little artist will have fun coloring this sheet. Ants are six legged creature related closely to wasps and bees. They are found mostly in gardens and house. They are identified by their elbowed antenna and distinctive node like structure. Ants are well known for their colonial behavior. The ant societies have communication between the individuals, division of labor and an ability to solve complex problems. 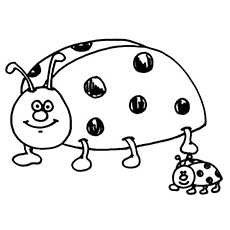 The coloring sheet features a ladybug sitting peacefully on a strawberry plant. Ask your child to add some beautiful colors to bring life to this scene. Ladybugs are beautifully colored insects found in gardens. Their color patterns vary greatly according to their specie. They have an oval, domed shaped body with six short legs. They have a red and orange colored exterior with black spots. This dragonfly is having a blissful time resting on a leaf. 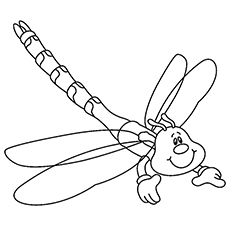 Help your child add beautiful colors to this black and white diagram of dragonfly. A dragonfly is an insect belonging to the Odonata order. These long winged insects are usually spotted around the gardens or other areas with leafy vegetation. Dragonflies are known for their large eyes and transparent wings. They have the ability to fly at great speed. Their bodies are adorned with bright colors like purple, blue, red and green with markings. 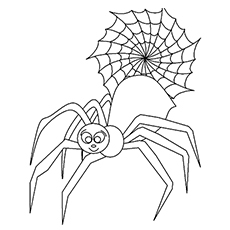 This spider coloring sheet is ideal for Halloween. Tell your child to count the number of legs the spider in the picture has. 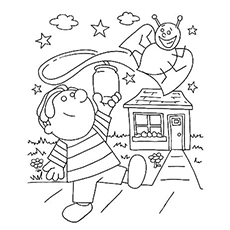 Then have a blast coloring this sheet with your kids. Spiders are insects that have long been depicted in popular culture and mythology. They are arthropods with eight legs and chelicerae with fangs that inject venom. The spider webs vary widely in shape, size and the amount of sticky thread used. 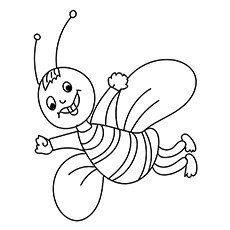 This coloring sheet features Flip, the grasshopper from “Maya- the Bee” series. While your child colors, tell him about the symbiotic relationship between a grasshopper and nasturtium flowers. A grasshopper is an insect belonging to the Orthoptera order. They have antennae that are generally shorter than their body. They make easily heard noises by snapping their wings in flight. This adorable bumblebee has stumbled upon his favorite treat, a bunch of flowers. He is busy obtaining nectar with the help of his long tongue. 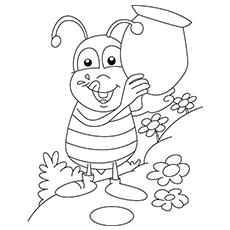 Use this coloring sheet to educate your child about bees and quell their fears. This will imbibe curiosity in them about the bee’s lifestyle and habitat. Bees are insects closely related to wasps and ants. They are known for producing honey and beeswax. 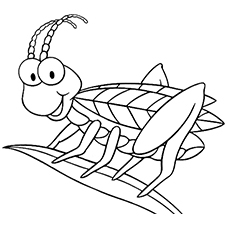 This coloring sheet features cricket, an insect related to the grasshoppers. 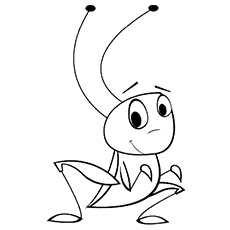 Ask your child to give this little cricket some color and teach him more about this fascinating insect. Crickets have a flattened body with long antennae. They are not harmful to humans. These nocturnal creatures are often confused with grasshoppers because of their similar body structure. 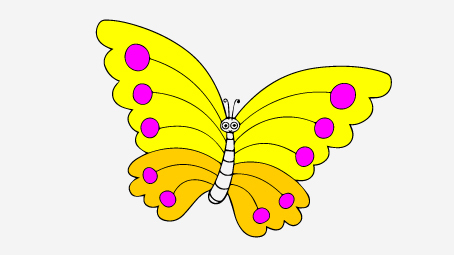 This caterpillar in the coloring sheet is beaming with joy at the thought of becoming a butterfly. Tell your little child about how little caterpillars become butterflies. She will surely be amazed. 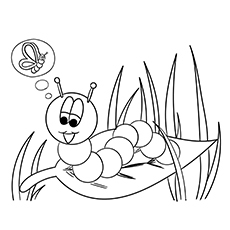 Caterpillars are the larval forms of butterflies. They have featured as important characters in literary works. Caterpillars vary in size, color and other physical characteristics. Most of them resemble the plant on which they feed. 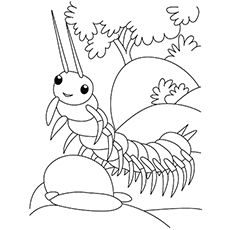 This coloring sheet features a creepy centipede. Centipedes are arthropods belonging to the Chilopoda family. Why don’t you and your kid color this sheet together? This will make a wonderful family bonding session. Centipedes are metameric creatures with one pair of legs per body segment. They have odd numbers of pair of legs. They come in drab color combination like red and brown. This picture showcases a little ant with a leaf, making its way. Ants are the strongest insects as they carry their own building material. This picture is apt for children who are above 3 years. This picture also showcases a happy bug which is excited to see your kid. You can allow your kid to choose different colors for this picture to allow her to experiment with colors. Later you can frame and hang it beside your kid’s study table. This picture highlights a number of cute bugs who are seen here in a large garden. The bug kingdom is the largest among all species with almost 6 million varieties. 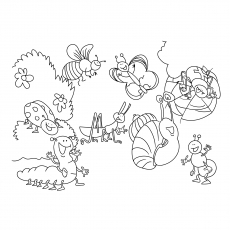 Coloring this picture will also give your little girl a chance at naming all the different bugs in the picture. The picture portrays from snail to the butterfly and so much more. This picture showcases the happiness a firefly feels by being a bright light in the world. Fireflies are the world’s most efficient producers of light. Show your kid a picture of the firefly to serve as reference; allow your kid to use bright hues for this picture. This picture showcases a number of bugs spelling two words. Bugs of different sizes come together to form the words ‘BUG OUT’. This picture will acquaint your kid with different letters of the alphabet. This picture showcases a large lady bug with her offspring. Lady bug eggs are shaped like an alligator with protruding sides. The picture will help your child learn about the offspring of a lady bug. This picture shows a little boy setting a firefly free from a jar. Fireflies are neither bugs or flies – an interesting fact for your kid. This picture is apt for children who are slightly more adept at coloring complex images. 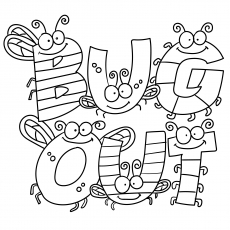 I am sure your kids will spend hours filling these free printable bug coloring pages online. 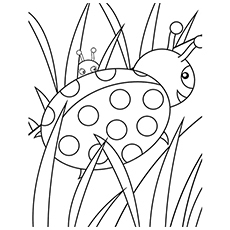 These bug pictures to color are free and can be printed for later use. Don’t forget to share your happy experiences with these bug coloring sheets with other parents in the comment box below.